Some people just need a little motivation and reassurance to allow themselves to see beyond what others think is possible, wise, or practical, while others just need a little inspiration to use their imagination wisely so they become part of a solution not part of a problem. 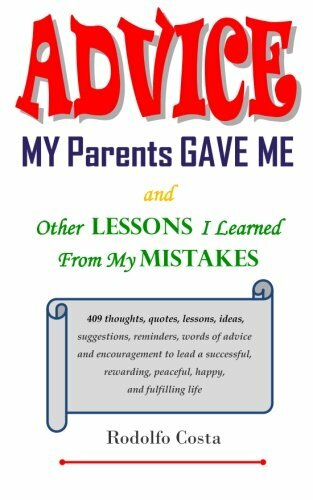 “Advice my Parents Gave Me, and Other Lessons I Learned From My Mistakes”—provides the motivation, reassurance, and inspiration to turn dreams into reality—409 practical, thought-provoking, quotes, suggestions, lessons, and reminders to encourage the reader to move forward to a successful and happy life, while becoming a better person in the process. Rodolfo Costa was born in Lima, Peru. At age nineteen, without knowing what to expect, he said goodbye to his parents and immigrated to the United States. Through the difficulties and joys of life, with the advice received and the mistakes made, he learned to embrace the world in a different and more positive way, and now with immense gratitude for the knowledge he gained, he is able to share his earned wisdom in his new inspirational and motivational collection Advice My Parents Gave Me and Other Lessons I Learned From My Mistakes. Today, Rodolfo Costa continues his learning, sharing his knowledge, and evolving as a person and human being. He is a business owner, a Realtor, a teacher, and always a student. He lives in Northern California.